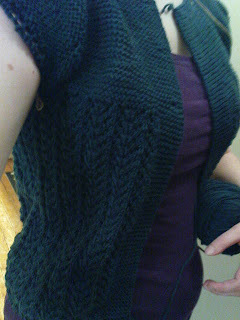 As many distiguished knitters of today, I currently - and appropriately - have the February lady sweater on my needles. Since January 24 I'm turning five skeins of Heaven's Hand in "Teal" into a stylish cardigan, and today I'm four pattern repeats from the hem (aiming for 30 repeats). Even though it's not a very intriguing pattern, at least not from the armpits down, I'm not bored with it (wait til I get to the second sleeve...), and it grows steadily. I don't think it will be finished by the end of February, but at least it's (almost) the only thing I've been knitting on this month.